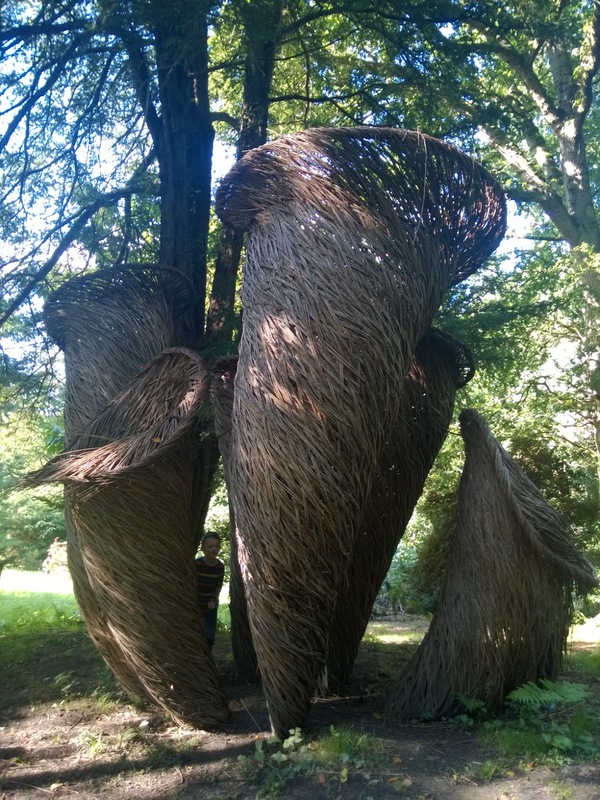 This weekend we visited Wakehurst Place in West Sussex, somewhere we last visited before the kids were born. We tried to go last year, but the London to Brighton bike race foiled our plans and after a couple of hours of traffic and diversions we gave up, but this year all went well and we finally made our long wished for return visit. A bit of a shock was that having previously got in completely free as National Trust members, we now had to pay £10 to park for the day which wasn't great as the National Trust membership already costs us a small fortune. 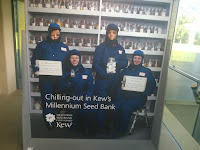 However it goes to support the work of the Royal Botanic Gardens Kew, so at least it was for a good cause. Wakehurst Place is a country house with a large beautiful garden, including woodlands and ponds, but more than that it is the home of the Millennium Seedbank, a hugely important facility which collects and stores seed from all over the world, as well as engaging in training, education and cutting edge horticultural science. We were really excited to find that on the weekend we visited there were special events taking place, including guided tours of the underground storage facility (for an extra £5 per adult, kids under 17 free). 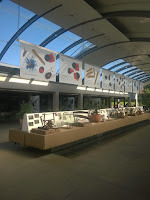 We arrived in time for one tour advertised, but must have just missed it as we couldn't see anyone around, so we waited and enjoyed the exhibits for an hour until the next one. 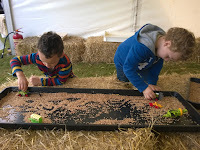 We decided Toby was too young and fidgety to enjoy it, but Ollie (who wants to be a 'scientist explorer and history farmer' when he grows up) was really looking forward to seeing it. However, when the staff arrived, first of all the tickets were apparently on sale at the entrance desk (not mentioned on the sign) so we and another family had to wait to see if there were spare places. 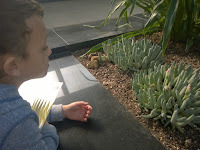 Then, when it was confirmed there was space they looked at Ollie (and another child waiting to go in) and enquired who would be looking after the children. Also not on the sign (which stated just that under 17s were free) was that under 10s were not allowed for insurance reasons. Poor Ollie, it's going to be a long wait until he's allowed in those hallowed vaults then. Still he enjoyed peering through the windows at the lab equipment and investigating the xeromorphic plants growing alongside the other displays. 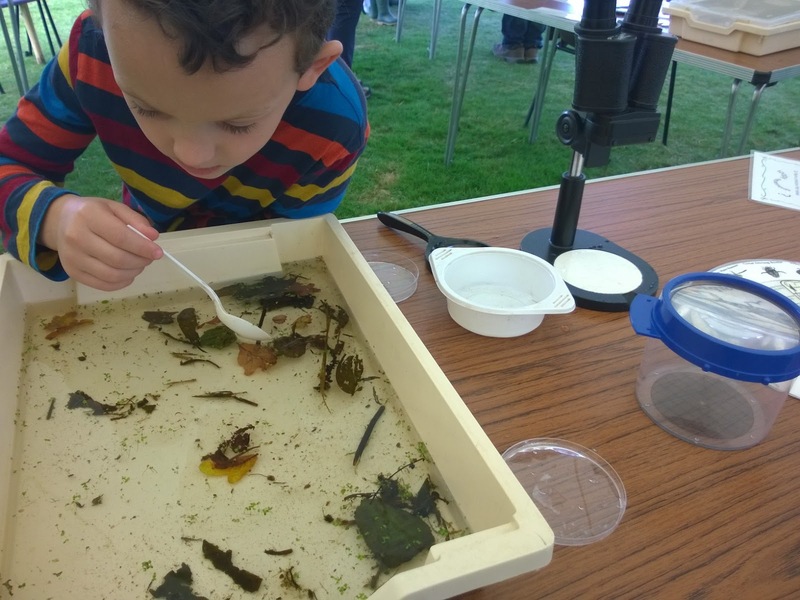 Fortunately the rest of the visit went far more smoothly, with excellent activities being run for families and other visitors, including a lovely pond life activity with knowledgeable folk on hand to help with identification of the various beasties. 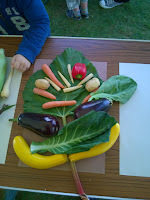 There was also a fun vegetable art opportunity for kids to make pictures using seasonal vegetables. 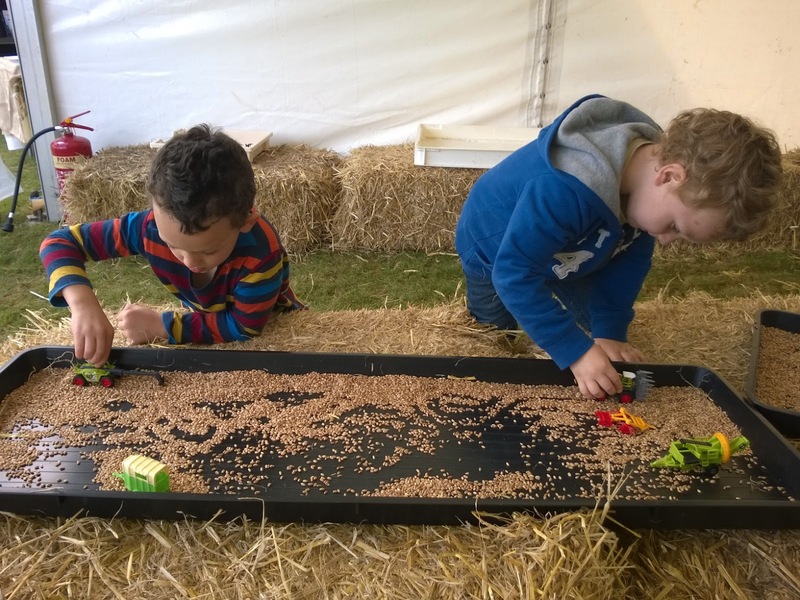 In a nearby tent we learned about seed collection and storage, took part in a seed identification competition and played tractors in a tray of wheat grain. There were also opportunities for seed planting and taking cuttings, amongst other stalls. 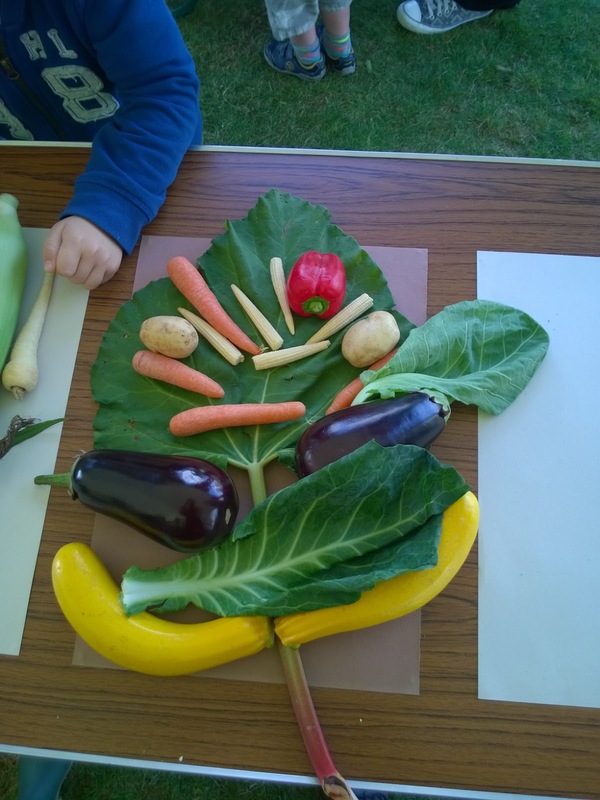 A wide range of stall holders were present at the event, selling everything from seasonal soups to bags of cobnuts. 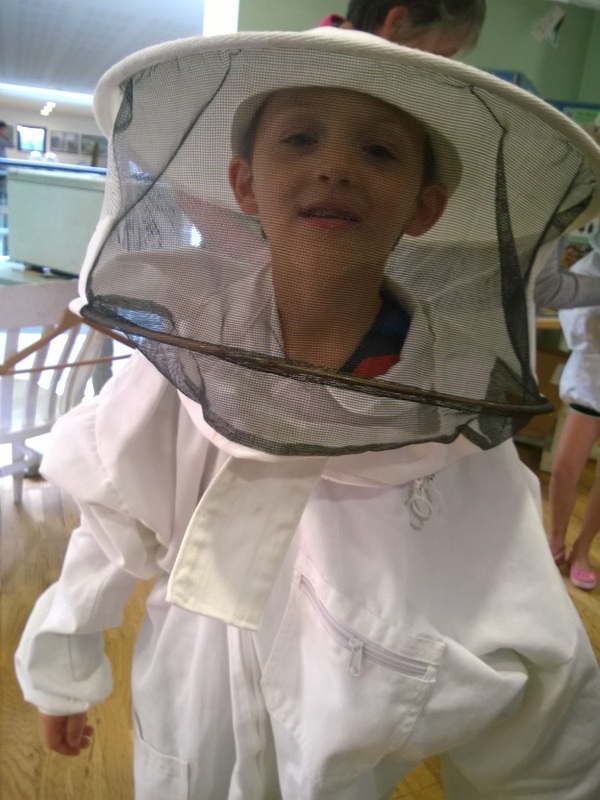 One of our favourite displays was the local bee-keepers association talk on bees and honey. The kids had a chance to get close to honey comb on frames, dressing up as bee keepers and honey tasting. Ollie even had a go at turning the handle on the honey centrifuge extractor and watching the honey poured into jars from it. The bee keepers were a really friendly and knowledgeable bunch keen to stress that their purpose as an association was to preserve and care for bees, including feeding their hives through the winter if they had not produced enough honey to support themselves after a bad year. Given how much we owe bees to pollinate so many of our food crops, it's great to meet people so passionate about them and get really good hints on what flowers to plant at our allotment to give them a helping hand. 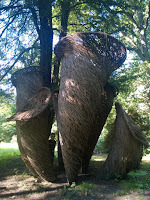 There is so much of the garden left to see that we will definitely need several return visits, but we were really glad to manage a good long walk through the wooded valley, past huge basketry artworks and down to a peaceful pond. I can see it as being a garden that's worth visiting in each season to get the best of the careful planting. Notes: The site has full facilities including cafes, toilets, disabled toilets and baby change. Most of the site is accessible, apart from a couple of paths which are marked as unsuitable for wheelchairs and pushchairs. The house itself doesn't have much to see compared to other National Trust properties, but is not really the main attraction of visiting the place. 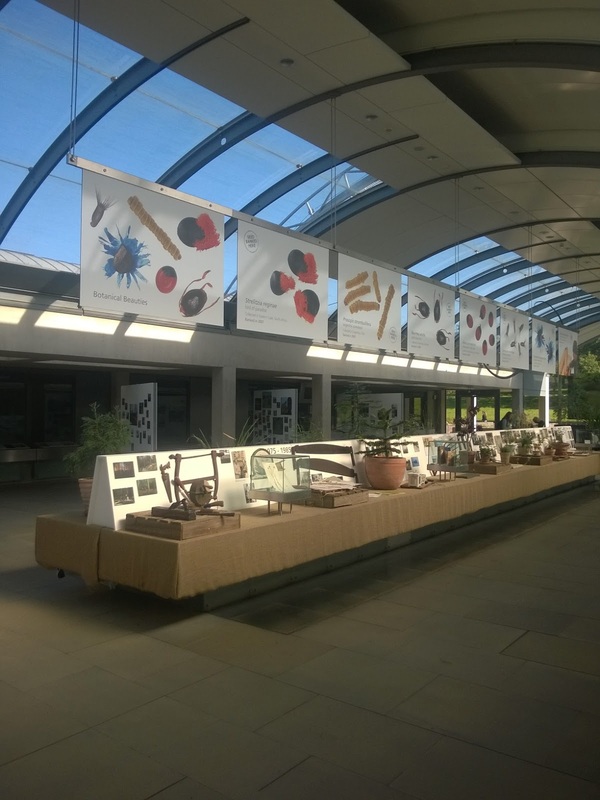 At time of writing entry is free for NT members, but parking is £10 for the whole day. Alternatively a day ticket costs £12.50 per adult, with kids under 17 free and that provides inclusive parking. Registered disabled visitors are charged normal entry, but can take an essential carer for free if applicable. Registered blind/partially sighted visitors can visit for free, as can their essential carers (if applicable). Not a cheap day out, but definitely supporting important work.